So you want to know about visiting Australia on a two-week vacation? Great question, because Australia is the 6th biggest country in the world and two weeks is not a lot of time. If you’re a first-time visitor to Australia, you need to put some thought into your Australia travel planning. First of all, let’s share some Australia facts to put into perspective how you need to go about planning a trip to Australia with just two weeks at your disposal. Many travelers disregard the actual size of Australia, and it’s landscape until they arrive and end up regretting the choices they made in the planning stage. I once had a British guy complain to me that he took a bus from Perth to Sydney and that it wasted three days of his trip, and all he saw was red desert. A little planning and common knowledge would tell you this! Where Are You Flying to Australia From? Need More Tips for Australia? In fact, it’s about the same size as mainland USA minus Alaska. Australia’s coastline stretches almost 50,000 kilometres and is linked by over 10,000 beaches. We haven’t been to everyone yet, but here’s a list of 38 of the best beaches in Australia that we recommend. If you were to drive through the centre from Sydney to Perth, a 4,000-kilometre trip, and you drove for 8 hours per day, that’s a five-day trip! We have a cattle station in South Australia the size of Belgium, and the world’s longest continuous fence – the dingo fence – built to keep sheep safe that runs for 5,530 kilometres through central Queensland and South Australia. So, considering Australia is so vast, the problem becomes how to travel Australia in a short amount of time, and where to visit in Australia? Rottnest Island, Western Australia maybe? “Australia would be my dream trip, but it’s so far away, and I only get two weeks vacation per year”. So the scenario usually plays out like this: those type of people never come, OR, because it’s their “once-in-a-lifetime trip” they want to cram everything into that two weeks and “see it all”, but in reality they see a lot of airports and the back of the seat in front of them. Whether we are visiting a continent or a country, our travel motto has always been “spend more time in fewer places“. Especially now that we travel with kids. We highly recommend instead of racing from one end of Australia to the another, focus on one region or type of vacation. Having to pack and unpack, deal with many airports, bus terminals, or lots of long road trips in Australia can lead to burning out and waste precious time. And too much moving around can eat into your budget. And you’ll need to be travelling Australia on a budget!! It’s not cheap. So slow down and take more in. That way you’ll get a better feel for a place and get to know the best things to do. Understand that you will never have time to see EVERYTHING. And be okay with it. Just like if we were to travel from Australia to the US with only a two week period we would concentrate on say California, or do a region like Los Angeles-Las Vegas-Grand Canyon. We wouldn’t go from the west coast to east coast and back. That’s the mentality you have to have with travelling in Australia. With only two weeks up your sleeve, you want to make sure you prioritize the things you want to see in Australia and the type of travel most suited to you. The answers to these questions will go a long way towards making sure you give yourself the best chance to have a richly rewarding Australia travel experience. You can pretty much do and see it all in Australia. We have vibrant cities, quaint country towns, world-class wine regions, ancient rainforests, mountains to hike, amazing reefs to dive, stunning beaches for swimming, deserts to explore, and unique wildlife. But, with only two weeks travel time, you need to focus on one, maybe two types of experiences. Below are examples of the types of experiences you could choose individually, or combine two of them together. If you are after a city style vacation, Australia has modern, vibrant, and diverse cities unique from each other filled with culture and natural beauty. On the east coast, we have the major cities of Sydney, Melbourne and Brisbane as well as the smaller cities of the Gold Coast and Cairns. Down south is Adelaide and Hobart. Over on the west coast are Perth and Broome. and in the red centre is Alice Springs. Australia’s major cities showcase its outdoor lifestyle, multicultural precincts, shops, theatres, bars, cafe scene, and sporting culture. For a food and wine vacation, you are well catered to Down Under. 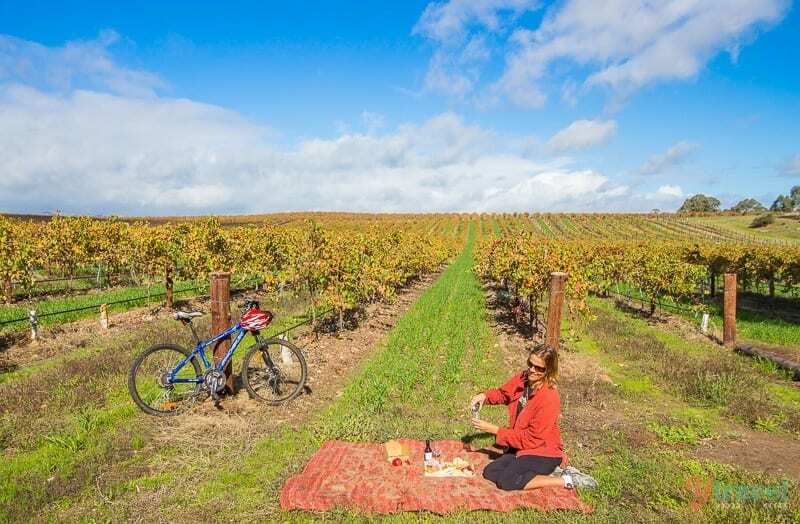 We have world class wine regions such as the Barossa Valley in South Australia, the Hunter Valley and Mudgee in NSW, and Margaret River in Western Australia. Or, you can drop into a country pub where you’ll be welcomed by the locals and can try one of their boutique beers. You can also try our amazing seafood, kangaroo steak, or experience many of our farmers markets with their organic fruit and vegetables, cheeses and chocolates. Australia is the island nation, so a coastal vacation is a popular option. With a stunning coastline of white sandy beaches and abundant water activities, Australia is the iconic beach destination. With the majority of Australia’s population living near the seaboard, the coastal lifestyle is where it’s at. An outback vacation is a vacation to Australia’s Red Centre and heartland. It’s where you experience the real vastness and dramatic landscapes of Australia, as the Top End of the Northern Territory. Experience life under the stars or on a cattle station, go horse riding, camping, and sing songs around the campfire. You can marvel at waterholes, rivers, gorges and creeks that make their way through our massive outback deserts. A visit to the outback is something unique and I, would encourage most travelers to put on their list. 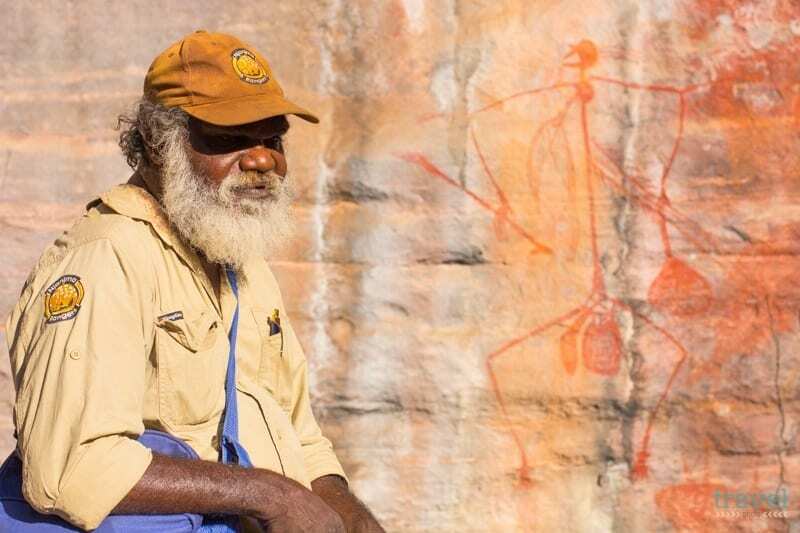 To have an aboriginal experience would mean spending time with the world’s most ancient living culture. Aboriginal Australians are said to have been on the Island for at least 50,000 years. Support Indigenous tourism entrepreneurs and help create sustainable employment. Australia is a great destination for a wildlife and nature experiences. From tropical rainforests to red-stone deserts, the wildlife that inhabits these areas are unique and diverse. Get up close and personal with Kangaroos in the wild, see Koalas on the Great Ocean Road, or spot whales, turtles, seals, and saltwater crocodiles. 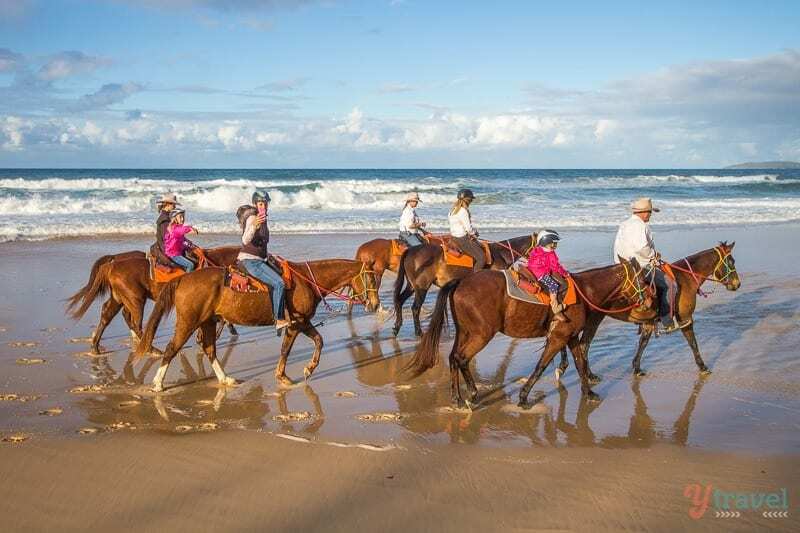 Take a trek through the mountains or walk on a canopy of trees in an ancient forest, or go four-wheel-driving on the world’s largest sand island, Fraser Island. If you’d like a bit of an adventure on your vacation, then Australia is tough to beat. There are white water rafting trips, camel and surfing safaris, crocodile spotting, diving, bicycle tours, horseback adventures, kayaking expeditions, and week-long coastal walks. There’s also camping, and four-wheel-driving adventures such as the Gibb River Road in Western Australia, or for the ultimate Outback experience try 5 day outback safari through the amazing Flinders Ranges. 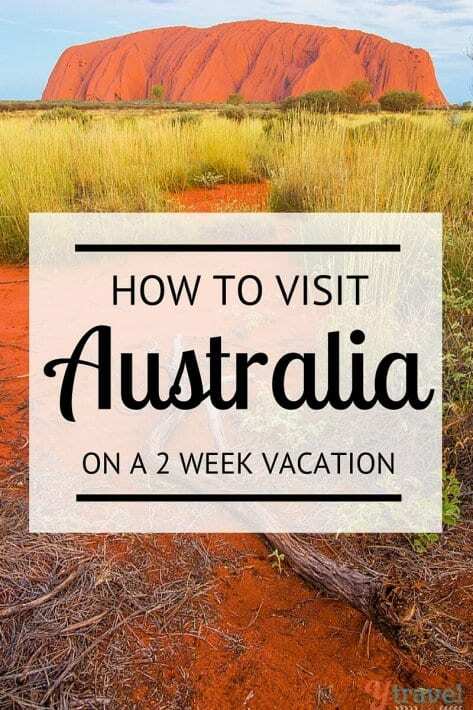 The following suggestions are for a two – three week period in Australia, and they take in the types of vacations mentioned above or a combination of them. They are merely ideas to be used as a guide, and further research is encouraged for planning a trip to Australia. Of course, your mode of transport and the distance you travel within Australia will affect how much time you have available in each place or region. These aren’t the only combinations, and to be perfectly honest I could easily spend the whole two weeks travelling Australia in Sydney and Melbourne and still run out of time to do things there! Once again, because your vacation time is short, you want to be smart with your flights by choosing the closest destinations to your origin to save time. If you are coming into Australia from North America, it will make sense to concentrate on the east coast and red centre. If you are coming in from the UK or Asia, you may be better off hitting the west coast. Weigh up the pros and cons of how practical your destination choices are. There’s no point spending a good chunk of your vacation time in airports and on planes. Don’t travel to Australia just for the sake of being able to say you’ve been there. Because if you race around trying to see a million things you will end up leaving feeling like you need another vacation. Give yourself time to absorb your experiences and create life long memories, not memories of planes and packing. Booking.com has over 20,000 properties in Australia. You get free cancellation on most rooms and a best price guarantee. Check out these awesome tours of Australia with our partner Viator. Can you share any tips for visiting Australia on a two week vacation? Out standing article! Plenty of content that flows to keep the reader interested, including myself. Which means I also have a couple of questions. Kangaroo Steak? I also assumed they were protected. This would be interesting chow! Is there an historical museum? I do know a bit how Australia came about, but became more interested when I read that our 13 Colonies were also populated by a large number of British “Transport” ships. The article when into detail about your History, but I was left wanting more. I totally agree about spending more time in fewer places. The culture sinks in, where as if you rush,it’s like your trying to set a goal. You will never enjoy the experience that way. Thank you Kevin! Love your enthusiastic response. Kangaroos aren’t protected. In fact we have too many numbers of them and they sometimes have to be culled 🙁 Their meat is one of the best animal meats you can eat. It is high in iron and very low in fat. It has a strong flavour but is really delish. A marinade such as bush plum is outstanding on it. Yallingup WA, this is my idea of God’s Country…. the favourite place on this earth that I have yet to lay eyes on! Great post! I totally agree that you can’t think of Australia as just one destination. It’s a country with vast difference in each region. Thanks for the idea on itineraries. This is something we want to plan in the near future. Awesome Amy! Glad you find it useful and are planning to come Down Under. Your family will love it. Caz recently had a week in Sydney, and even though we have grown up in the area, she did all this amazing things she hasn’t done before and just loved being in the city as a traveller. One of the world’s best. Awesome post! I’ve only spent about a week in OZ – less than 2 days in Sydney, and about 5 days visiting my uncle who lives in Perth. Definitely not enough time, but I know for sure I’ll be back someday! Wow a week is little, but as you have proven you can have a good time regardless. And it has motivated you to come back and see more. Is that the Feral craft brewery just south of Perth? I sent this to my friend! Her dream destination is Australia but she’s worried about not getting enough time off work, being an accountant and all. I went for a month and I still didn’t think it was enough time. But this post makes some really good points. Thank you for sharing the post with your friend Bula. Ideally at least a couple of months in OZ would be optimal but that is not going to be a reality for many people. That doesn’t mean they have to stop the dream. Hopefully this post will help your friend to know that she can still come over here for two weeks and have a great time. I actually just came back from about 2 weeks holiday in Australia, and 1 week in New Zealand. Definitely not enough time but I know I’d be back so I didn’t want to go all over the place all at once. I concentrated on Sydney and Melbourne and loved every moment of it. At one point I was meeting all these people going up to the Whitsunday or the Great Barrier Reef, and I was so tempted to drop $500 just for those last minute trips but I’m glad I decided against it. Too much, too little time = too exhausting! The only thing I reaaalllyyy wished I did was the 3 day Great Ocean Road tour from Melbourne to Adelaide. But it’s okay, now I have more things to look forward to when I go back! The Great Ocean Road is a great trip. Like any other travel you need to allow enough time to stop and visit the special places along the way. Think Bells Beach, Lorne, Apollo Bay, with some amazing beaches and cliff areas to visit along the way. Hey! Me and my friend are really wanting to go to Australia and New Zealand. We only have aproxomatly 3 weeks, just like you spent. So i am just wondering how you spent your time, and how you reflected about it, and what you wish you maby did diffrently? Sorry for asking, i just want to making the best of it. Great article, loved my 4 months in Oz. Best parts for me were 4wd round Fraser, diving on the Great Barrier reef and trip to Uluru. These are experiences we are yet to do but would so LOVE to do. I did a road trip in Australia with my oldest daughter when she was 13. She still remembers it as one of the best holidays ever. We started in Brisbane and ended in Melbourne. Took about 3 weeks. Such an easy country to be in, Australia. So glad your daughter has such great memories of our country. You can do that just by taking your time and enjoying a small slice of this huge land. Brisbane to Melbs is a good 3 week journey. When I read your title, I thought, “Not possible!” So glad you didn’t advise people to stay one night in each place, racing around the entire country. This is a great post highlighting the best of Australia, so people can choose where to spend their time based on their interests. An Amazing Race is not the best way to see any country! It’s all about smart choices. I don’t know, the Amazing Australian Sight-Seeing Race sounds pretty awesome to me. Great guide, very thorough and in-depth. That photo of the seafood is all the motivation I need to book my next trip. Forget everything else, I’ll just eat! Seriously though, taking it slow is always good advice, and when people try to rush through everything, they end up seeing nothing. Good planning and preparation can make a huge difference when you only have a limited amount of time. That seafood platter was at Rottnest Island, Perth in Western Australia. I was there two weeks ago and it is amazing. Check it out. That is everyone’s dream road trip for sure, a whole lap around Oz. But like you said, a focused 2 weeks is still definitely worth the time and effort. This is a comprehensive resource, well done! Wow, Cairns to Sydney in 8 days is really moving. Way too fast for me. I bet you’d love to have that time over again and either do Cairns to Brisbane, or Brisbane to Sydney? Great tips! If I had 2 weeks I would do a couple days in Melbourne, a couple days in the Outback, and a couple days in the GBR. Great observation Craig, this will really help to those travelers who have no idea to visit Australia in there business visit. Really you provide a quick travel view of Australia. This is excellent! It’s such a shame when people come and try to cram too much in–they spend so much time in airports and in transit that they miss out on the real beauty of the country. Would much rather spend two weeks in Melbourne/Tasmania (obviously my favorite recommendation!) or that time in Sydney/New South Wales area. No use spending all that money and that long plane flight and not really enjoy the best things Australia has to offer! p.s. totally guilty of not understanding just how big Australia was until I got there! My mom was always asking me why I wasn’t just “popping over to Perth for a weekend.” Took a long time until she understood that would be like just hopping to NYC or Florida for two days from California–totally not worth it! Great guide to Australia! I was fortunate to spend 2 months in Australia during my RTW trip, and I still wish I’d had more time! There is so much to see… I agree it’s best to pick one region/theme for a two week stay, otherwise you will feel way too rushed. I recently spent 2 weeks in Australia(and I was flying there from NY). Visited Melbourne, Alice Springs, Uluru, Cairns, and Sydney. Although it was a lot of traveling in a small amount of time it was a great experience. Toured Melbourne and visited Phillip Island. In Alice Springs we saw the School of the air and the royal flying doctor service. Visited Uluru and hiked in Kata Tjuta. In Cairns we snorkeled the Great Barrier Reef and enjoyed a hot air balloon ride. Toured Sydney, saw the beaches, an opera at the opera house and even enjoyed some fun at Luna Park. Australia can definitely be done in 2 weeks. I do recommend anyone flying from the east coast of the US to enjoy a day in LA before flying to Oz because it’s a really long flight. And your trip to Oz sounded great! Can you please let me know how you managed to do so much in such a short period of time? How many days in each and what modes of transport you used between each location? Hello, I have 20 days to spend in Oz, flying into and out of Sydney. I want to go to Melbourne, drive the great ocean road. 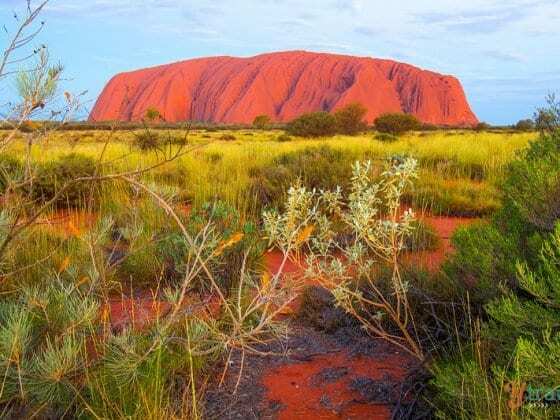 see the reef, and Uluru and spend a few days in Sydney and the blue mountains. Can you help me with my itinerary? What is the best direction I should take. I already have a flight the same day I land in Sydney to fly to Melbourne. I have family to se there. I am flying in from the US. Not going to lie, kind of wish you wrote this a month ago. 😉 Haha. We stuck to the typical route, started in Melbourne and headed up the E. coast, ending in Port Douglas (Cairns) and gave ourselves one month. Boy did we underestimated the size of Australia. So many 12 hour overnight bus rides, so much time lost. But even though we had an ambitious itinerary, we loved every part of it! Don’t want to burst your bubble, but to be honest doing the Gibb River Rd and the Barrier Reef is VERY ambitious in 2 weeks. So your plans are flying from Sydney to Western Australia. Just a heads up. From Sydney to Perth is 5 hours and quite expensive, and then from Perth to Broome (near Gibb River Rd) is a couple more hours and also expensive. Oz internal flights much more expensive than in USA. Not sure if you can fly from Cairns to Broome or from Brisbane to Broome or you need to go via Darwin? We have only done Sydney to Perth. However, coming from USA with just 2 weeks I think your better hitting east coast Oz and maybe red centre (Uluru) otherwise you might spend your whole time flying or driving! So possibly Cairns (Great Barrier Reef) and Alice Springs (Uluru). OR, just stay in Queensland for whole 2 weeks. Hi Craig. Very helpful article, thank you. Question: My husband and I will be in Australia for 2 weeks in December. Is it feasible for us to arrive in Sydney and stay for 2 days, take a plane to the red center for a 3-day camping tour, fly back to Sydney, then rent a car to drive up to our timeshare in Port Macquarie where we’ll spend the second week? I think that’s quite reasonable. Of course, 2 days in Sydney is never enough. Have you visited Sydney before? I agree with this. Rushing from one end of australia is pointless. A popular trip is the cairns to sydney coastal trip. A good one if youve only got a short amount of time. I am planning to go with my daughter, 12, to Australia this July. Since it will be Winter, after spending some days in Sydney, where we will be arriving from Buenos Aires,I was thinking to go north looking for the warm weather. We will have three weeks in total. What would be your recommendation in terms of itinerary taking into account her age? Thanks! When planning a holiday in Australia I would recommend a month at least, if you want to to drive around Australia I would recommend at least 6 months. Two weeks is a challenge, most likely you will arrive in Australia at Sydney or Melbourne, I think it would be best to stay on the east coast unless you really want to fly to a special destination for a few days like Central Australia (as someone mentioned in an above comment). In winter go north up the east coast, in the warmer months you can visit Melbourne and the southern coast and drive the ‘Great Ocean Road’ for an extra special scenic drive. I am in the U.S.. With the price of airfare, to me, a 2 or 3 month stay sounds best if I could swing it. It depends. Personally I wouldn’t stay in Sydney more then one day. It is nice place, but it is just another city. I can’t understand what people can do for a week there especially when they are coming to Australia only for couple weeks. I totally agree, don’t spend your entire trip in the cities! Get out and explore a few different things. We spent two weeks, hopped about hitting SYDNEY, melbourne, Hamilton Island and Cairns, but it was the most amazing country and vacation of a lifetime! Great article! I’m thinking about a trip in December for 2-3 weeks, coming from the United States. My husband has been a few times but this will be the first trip for myself and our 4 year old daughter. He has relatives in Sydney so I think most of our time will be spent there but we may want to venture out elsewhere. We love the beach and would love to see a koala. Any suggestions? Only about an hour south from Sydney is the Royal National Park which has beautiful beaches and you might be lucky to see a koala. It is pretty rare to see a koala in the wild especially around Sydney area. There is of course Taronga Zoo which will guarantee you’ll see one. Before that I’d never seen one. 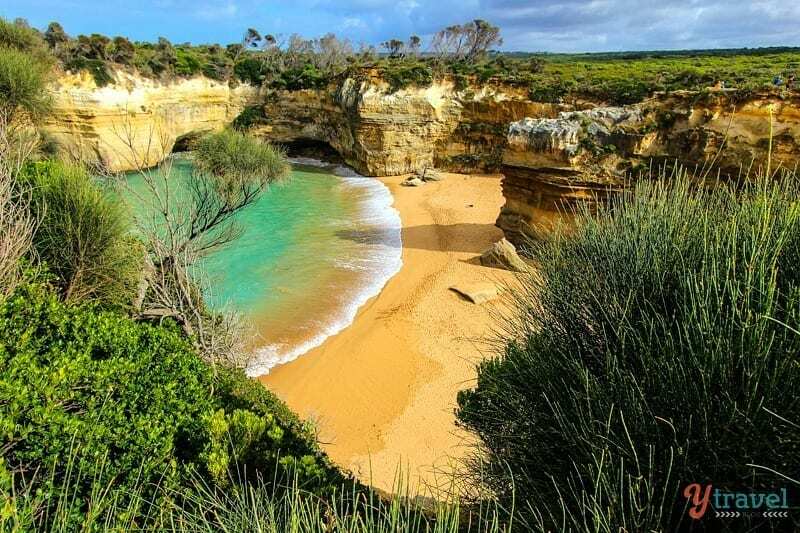 The Northern beache of Sydney are beautiful and also the Central Coast, which is the area we live in has beautiful beaches and bushland, where koalas are but are rarely seen. That’s a great round up on Australia. I once flew here, from the UK, for just 5 days, I think I spent more time travelling than I did on the ground! I’d already spent 3 months here, backpacking and camping my way around, so I didn’t need to see Ularu, The GBR and Darwin in just 5 days. I did manage to conceive a baby in those 5 days, at Cronulla Caravan Park, so romantic! He’s 8 now. Love the new site, it looks fantastic. Nice comprehensive Aus article… I love Australia… your photos make me want to return to Aus and explore the West Coast. Great tips, would love to go back to Australia and visit western Australia, it seems awesome. I’m lucky I live here so I plan to see bits and pieces now and then. I agree people with only two weeks should stick to a few key places, and if they need to save time (and can spare the extra money) they could use Jetstar flights to fly within the country cheaply. What a detailed resource. Thanks for putting this together. I plan on travelling to Australia some day so I’ve definitely bookmarked this! Couldn’t agree more! The itinerary will make more sense if you look up on the map for the various location one wants to visit and plan wisely. I went on a 2 weeks vacation to eastern Australia during end December 2011. I went to 5 different places. Gold Coast, Brisbane, Sydney, Canberra and Melbourne. I felt that my itinerary was not too bad, flew from Brisbane to Sydney and took an overnight coach from Canberra to Melbourne. It definitely help me save the time and $ on a night of accommodation. I manage to go Blue Mountain and Great Ocean Road. They took almost a full day trip. I wish I could spend more time in Sydney and Canberra. Would love to go back to Sydney… to Hunter Valley and visit the famous opera house and hopefully to countdown to a new year with the magnificent fireworks on the harbour bridge! I agree that 2 destinations might be a better plan. Sydney is a fabulous city–we have been there 3 times. Don’t forget to consider the travel time between locations–you will lose the better part of one day to get from Sydney to Cairns. You will find there is much to do,enjoy your stay in Australia,you will be back. Lets hope soon I can have my own experiences, like the ones you’ve had together. After reading this blog, I am planning to my next vacation in Australia with my family. I dig the philosophy of “[spending] more time in fewer places”. Of all the mistakes first-time or novice travellers make, overplanning has to be the biggest (and I’m sure we’ve all done it at least once before). Your excellent advice applies, not only to the colossal continent of Australia, but anywhere really. One can’t see all of Europe, South America or Southeast Asia in a month either; why would anyone even try? I’m sure you’ll agree with me, Caz & Craig: If you want to actually experience a place, slow travel is really the only way! Its good to see more people advertising australia and suggesting Adelaide! Everyone seems to go to the Eastern coast, leaving out what some of make Australia great! It would be nice if we made things more affordable for travellers/backpackers! I’m sure it would bring in more tourism! Nice post. I will put this on my lists. As a fellow Aussie would have to agree with everything you wrote. I don’t think it should matter how far you go, always always take it slow once you get there! Take some time to get to know small details, speak to people, really understand a place. I still remember my first Europe trip at age 20 which was just a blur and so stressful because I wanted to see everything!! So true. It is tempting to see as much as you can just to say you have been there, but it’s the quality and the memories you should be aiming to achieve. Thanks for sharing Matthew! I didn’t really consider Australia as somewhere I’d like to go before, but realising just how vast it is by this post has made me change my mind. A bit scared about the snakes etc, but I think I may well go on a cruise instead to reduce that chance of death 😀 If I do, I’ll go in 2014 on the Ocean Princess just for a day or two and see what it’s like. I’m sure it’d be amazing but I’m scared I’d want to emigrate. Australia is among the top rated beach travel destination since the fast two decades. Never been though but would love too. The pictures are really awesome. Like the others, I’m impressed with your site. I’m from the States, but living in Melbourne since 2001, and — while my reading didn’t hit on every suggestion or question, I didn’t see anything about camping (which happens to be my fav way to travel). When advising my mates from the U.S. that’s what I recommend. While I have my own camper van now, before I hired. Been from Kangaroo Is. to Darwin and Perth to Port Douglas and through the middle. What I might recommend for anyone, say, visiting for 2-3 months, is buy an older van. What I don’t know (but have seen some) where those leaving Australia — after their travels — offer to sell, such as Byron Bay, Cairns, Darwin … and where else and how to do it? My life long dream was to visit Australia. I got as far as Japan via Military service. Great info on Australia so I thank you. Is it possible to visit Sydney, The Great barrier Reef, and Melbourne in a two week period. Yes Juan. I think this is really possible. You’ll have a bit of flying so allow for the extra cost for that, but otherwise this is a reasonable trip. Thank you for responding. Ill let you know how it turns out in the fall. Great article. I just planning to have a graduation trip to Aussie this October. I plan to fly to Perth then travel on the road using caravan/trains to Melbourne – Tasmania then going back from Sydney in 2 weeks. Is it possible? Or it just like wasting my time there? Thanks! To fit all of this in in 2 weeks could be a little pushed. the distances in Australia are quite large. IT depends on how much you want to see at each place and how you can handle the constant movement. I guess if you only want a few days in each it will be okay. So glad I stumbled on this. Have been planning a bday trip for my daughter’s 30th and have already forced myself to drop two destinations. We have three weeks, plan is US to Melbourne, Great Ocean Rd to Adelaide and Kangaroo Island in 6 to 7 days. Fly to Cairnes, Great Barrier Reef/Daintree, fly to Brisbane and rent a car to drive up the Sunshine Coast (another 7 days?) Then fly to Sydney for 3 or 4 days to include Blue Mountains. Now even that sounds too ambitious? I’m nervous about driving and am not finding good info about taking the train to the Blue Mtns and being able to get around well enough to do a couple of decent hikes. Any on the ground advice in that area? We will be visiting Australia this November (2013) for our honeymoon. We have booked our flights from the US to Australia as well as our flight once there. We will be there for two weeks spending 6 Days in Cairns, 2 Days in Uluru and 6 Days in Sydney. Any good suggestions on where to stay (affordable price), what to see and do? We are more adventure seeking people but, we also want to experience the city (Sydney) as well. Any suggestions/help would be greatly appreciated!! Don’t forget the search bar on our site is a good place to look for anything specific. Enjoy your time in Oz! Hi. I am flying to Perth in October from the UK to visit my daughter who moved there a few months ago. I have 3 weeks in Australia but as well as spending time in Perth would wish to visit Melbourne, Sydney, Brisbane and Cairns. I doubt I will be able to visit again.Would I have to arrange internal flights between each. How much time would I need to allow out of my 3 weeks. Great article, except no mention of the Great Barrier Reef or the Whitsundays, which are a must for a beach holiday in Australia! Hi! Loved your article. I’m actually planning to visit Australia in June, but only have to weeks available. I’m basically looking for a combo of beach&sun, culture and wildlife. What would be the best itinerary to squeeze into 14 days? I’d probably go the Sydney to Gold Coast route. Or, if you have your own vehicle the Sydney to Melbourne route is a bit untouristy and you’ll have better wildlife encounters. I also think the beaches are stunning. My cousins are coming to visit from the UK after a massive asian tour for 9 momths. Being a sydney local, I guess it’s hard to find things that we feel arent too touristy. I need helop trying to keep them entertained for 2 weeks while here on an extreme budget. We are doing the ferry to Manly trick and the hunter valley wineries. Was thinking a drive in my van down the great ocean rd? They want to go to Cairns but I’m finding it very hard to make it work with their budget of a combined $130 a day! First of all, great article! It’s really a trip of a life time, not only because it’s far, but also because it’s so different from everything we can find in other places. Is that doable? Or should I cut off the drive from central coast to Brisbane? What else would you change? I plan to leave Brazil on the 4th October and, hopefully, get a flight that arrives on the night of the 5th! Thanks for your help and taking your time! You can drive there 12 hours so if you take 6 days you’ll be fine. Thanks for a great article. I’ll be saving it for if we ever get back there. Our “once in a lifetime” trip was our honeymoon. We did 18 days and spent time in Adelaide, Kangaroo Island, Mildura, and Sydney. On a spur of the moment decision, we scrapped four days of our planned itinerary and drove the Great Ocean Road, stopping at whatever caught our fancy. Best decision ever! 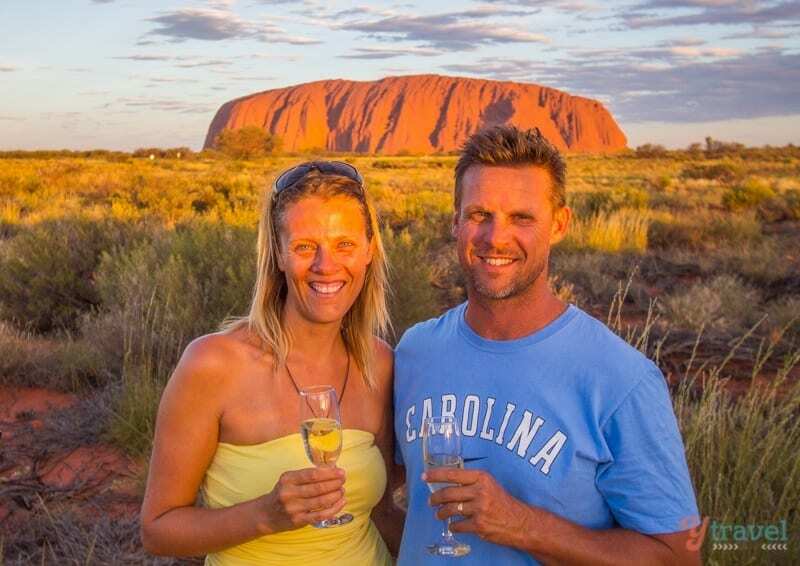 Our dream is to return to see Darwin, Perth and Uluru at least…maybe two return trips! We are planning a trip to Australia and we will have 15 days there! We wanted to see sydney, maybe blue mountain if we have time too, and the catching a plain to Cairns and staying in Port Douglas for a 2-3 days to visit the Daintree and doing some snorkeling at the GBR. our doubt comes now: do you think it’s worth it/feasible to go for a couple of days to the whitsundays? I have heard they are also a must. Or do you have some other suggestion? Also, I have read that around october-november stinger season starts. Is that true? will it be a problem while in cairns or the whitsundays? We haven’t asked for our holidsys yet, so when do you think is best: ends september or first october? So that we can have warm-sunny- free stinger days? Asking for too much maybe? Thanks a lot! And thanks for the article and great info!! I would like some advice I have approx two weeks,I am visiting my daughter who will be in Queensland.I want to get as much out of the holiday as possible.I fancy going to Sydney,then to Ayres Rock and then on to Cairns and then the Great Barrier reef.Does this sound practical and have you any advicd for me? Great article! Was so happy reading this, I will be in Australia for 3 weeks in November, and there are a lot of things I wanted to do, but made the choice to skip out on so I could spend more time with the friends I’m visiting. I now feel like I’ve made the best decision and I can’t wait to go! I can really recommend the NSW coast – there are fabulous beaches that stretch for miles without a house in sight, thousands of acres of untamed forest to explore, and lots of great little coastal towns that are far cheaper to stay in than the more touristy places up north. You can go whale watching in Eden, scuba dive with seals off Montague Island, feed wild Rainbow Lorikeets that fly down out of the forest all along the coast, walk up an extinct volcano at Mount Warning, get up close to wild kangaroos at Pebbly Beach, have your picnic lunch stolen by a six foot long wild goanna near the amazing Jenolan Caves, drive through the beautiful Kangaroo Valley… and if you’re in Sydney, take an afternoon to try one of the many great walks on the Harbour foreshores, some of which will lead you through native bushland with great views across the water. Canberra is great for wildlife – the bushland comes right into the city, and the local kangaroos can easily be seen grazing all around the place. Oh no, you have completely missed Canberra, the nation’s capital! I think you need to spend some time here too! There was even a NY times article recently on: 36 hours in Canberra. The capital is also on the east coast, just a 3 hr drive South from Sydney and has a lot to offer! Great article. We have about 4 weeks in Oz next month … Really interested in the outback as already done a few cities in Oz before. (That said a city to top and tail the trip would be cool) Can you recommend anything … Be it tour groups or just a vague itinerary? We will probably fly in from Singapore so starting point is fairly flexible. Thanks. after trawling the net this was the most simple and helpful blog yet as we are travelling to Australia this Christmas for to weeks for a final family as we know it holiday( boys are 16 and 18growing up moving away etc) . We fancy the goldcoast as we heard there are good amusement parks there and we love them, any tips ? Glad you found our post. The Gold Coast is definitely a fun family destination. Below are our recent posts on the Gold Coast. Well, you can visit over 9 days but don’t try and visit too many places. I would pick a main city and its surrounding region. What type of experiences are you interested in?? Want to travel by road from Syndey to Brisbane and onward to Cairns. Have about 6 days at my disposal. Would appreciate a few tips how best to do this. Would like to see some nature/wildlife – and enjoy some good food. Love your travel tips, especially the continual reminders to slow down. I spent a month (house sitting) in Sydney when I was 14, forty years ago now and have vivid and excellent memories. Among other things, my sisters and I slid down the banisters at the Sydney Opera House. We came in from the west coast of the US through Hong Kong where we had a 36 hour layover. It made sense at the time and was fascinating for this 14 year old. It would seem to me that this route might give you several options from all parts of the world. At that time, there were quite a few flights to different Australian destinations. Plan is like 3 days sydney,3 days gold coast and 3 days cairns..we may spend one extra day in sydney…I wanna experience beach fun, scuba diving, city life, seafood…and yes wildlife is on my list..Can you pls guide if we are doing it right with this plan…i want to make maximum of days we have..as this would be once in lifetime trip for us..
Planning a 10 to 14 day trip to Australia (from Singapore), with parents and two kids (1.5 and 3 yrs old). Priority will be for the kids to have experience with nature. need a full australia trip good plan for seniors.. Its for my parents who retired last month and want to visit and see specially the outback, cities, gbr etc. Please if anyone has ever covered most of it and cares to share their itinerary, i would really appreciate. have checked lot many tour operator websites ad they have only small portions covered. Could be a 3 week trip. The thing that’s tripping me up about our planned itinerary is how to organize the flights. We’ll be departing from Los Angeles. Do we try to fly directly into Cairns (can you even do that? ), then Sydney, then back to LA? Do we fly to Sydney, stay for half a week, then do a round trip to Cairns for about a week and then come back to Sydney for another few days before heading home? Anybody who has done a similar trip have advice? We are planning to visit Australia late next year in November, can anyone give us some advise please? Many thanks, Noel. Hi, just after some planning advice. From the uk. I have a month time scale and im wanting to visit the west coast of oz, brisbane and new zealand and possible hire a camper van for the west. Would it be to far to drive from perth to darwin? And some of the scenic route is 4wd can it be done in a camper van? How long do you have? From Perth to Darwin is 4,042 km. That’s a long drive in a short time. 4wd is preferable but not essential. We don’t have one and see lots of sights. I have 1 month in total. Was looking at 2 weeks for the west coast? We have 2 weeks of travel in Australia (plus 3 days of getting to/from U.S.). Two of us, our 4-year old daughter (who’s very adventurous) and my 75-year old Mom, who is also very well travelled, but not up to major hiking, etc. Thinking of flying into Sydney, heading to Melbourne, then Adelaide, flying back to Sydney last day before flying home. 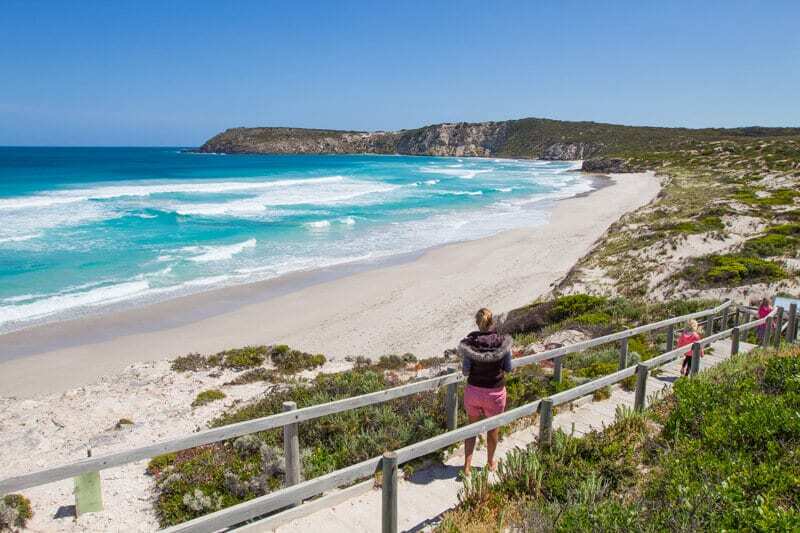 Two weeks to explore for a couple of days a major city or two, see some sights, travel the Great Ocean Road (3 days, 2 nights), 2 days on Kangaroo Island. My Mom has been to Australia before, so is game for anything. Want to ensure my daughter has fun, only drawback to this itinerary seems to be a lot of car time. Would love any feedback, and again, great website! Thanks for the suggestion. We’ll probably drop Adelaide from trip – looks like we’d be spending 4 or 5 days in the car, no, were we to drive Syd – Mel – Ade. We are coming to Australia in just a week and a half. We will be in Sydney for 3 days for New Years and then fly to Perth for 9 days. We love the Coastal experience. What do you suggest for Sydney since its our shortest block of time? 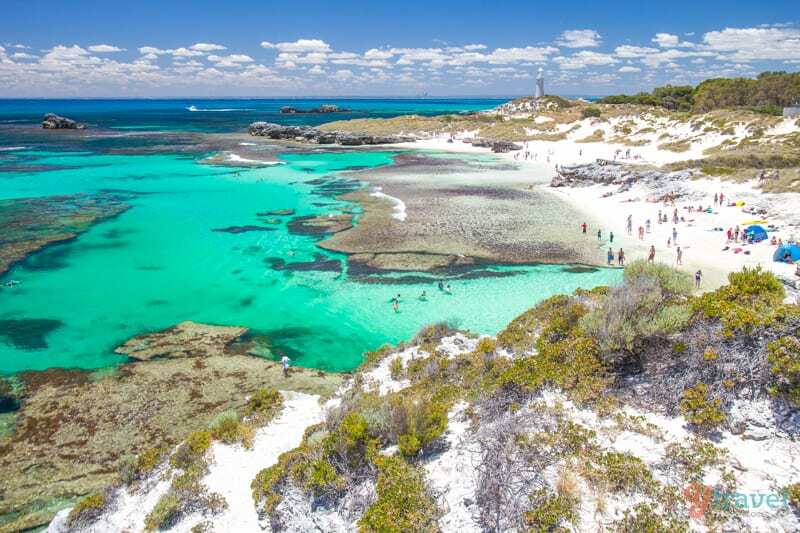 What do you recommend for Perth-which beaches (will be in the Free Mantle area of Perth)…..SO excited!!! It’s a great time to be in Sydney. It will be busy and expensive, but worth it. You can stay at the YHA’s which will make it much more affordable. Thanks. I’ll look for yha! I would love to visit Sidney. I have never seen little koala bears, not even in the zoo. My ideal vacation would be on some villa near the ocean. You can. I’m sure many do. You’d have to plan it very well as I can imagine you’d be very rushed. WE don’t have any brochures or organise any trips. We’re a personal travel blog. Sorry we can’t help you more. Hi. My family are planning our first trip to oz around Christmas 2015. Been very interesting reading all the suggestions. We have relatives in Brisbane but would also like to visit Sydney, we have a 7 and 5 year old so don’t want to spend all our time in airports. We will break our uk journey up by stopping at Bangkok for 2 nights on the way out. Any suggestions whilst in oz would be appreciated. Thanks. I live in Australia and I never want to leave! I’ve done so many trips around straya in my life and still haven’t done everything! I definitely recommend 80 mile beach, great ocean road, barrossa valley, gold coast, Katherine gorge, coral bay, monkey mia, broken hill, bucken caves and many many more. I also suggest hiring a motor home! I did that for my NZ trip and it couldn’t have been better!! I’m one of those people from the USA, and this would be my once-in-a-lifetime trip 🙂 I have a couple years to think about it and save up, but I think I know what I want to do. My dream itinerary is to go to Alice Springs region (to see Uluru, etc. ), Mungo National Park, and Coober Pedy. Would that be a feasible trip for 2 weeks? Hi, Great information on traveling in Australia. We are heading to Perth in January 2016. My husband, and a friend who lives in Perth, are getting ready for a motorcycle race on Phillip Island. We only have 2 weeks in Australia during which we will be in Perth for 3 days, then flying to Melbourne to drive to Phillip Island. We expect to be on the island for 5 days for prep and the races. After that my husband and I will drive to Sydney for our flight back to the US. Sounds exhausting just writing this out! Enjoy your time in Oz!! I have been searching for an article like this! Planning my 3week trip to Australia in Dec2016. First time going, & I’m very adventurous, love wild life, but also want to experience the night life! Please HELP! Fantastic write up. My husband and I are planning to travel to Australia and New Zealand over 3 weeks, although we have friends and relatives over there we like to explore for ourselves. Our good friends live in Brisbane and we will be spending a couple of days with them. Our agent has done us a driving tour around the coasts from Brisbane to Port Douglas, I wondered why but your explanation helps me understand the concept of seeing and enjoying one area instead of flying back and forth. We also have excursions factored in. We love travelling and now our kids are grown up we want to do more of it. Thanks so much. Looking forward to receiving your newsletter. Loved your descriptions. My fiance and I are looking for a spot to honeymoon. I was hoping to try and do 2 weeks in Australia. It will have to be in June, due to our busy schedule. I am more into wildlife, and hiking but he needs the beaches. Will it be warm enough to plan a beach honeymoon in Australia. Since we will most likely stay in the norther areas if we go during June, are there enough areas to enjoy a safari/wildlife? Would it be worth it? Hi ! So excited my husband and I have a trip booked to Oz in November. We will be here for about 15 days. We fly in and out of Sydney and are wondering if our travel plans are too ambitious? We fly into Sydney the 11th and thought spend a few days there. Then fly to Cairns/ Port Douglas and spend maybe 5 days there , fly to Brisbane and drive back down to Sydney from there. Is this way too much? that would leave us with around 6 days or so to do that drive. Not sure if rental car fees would be over the top for doing a one way rental. Haven’t checked that out yet. If you have any other ideas we would love to hear them !! Thanks so much! Me and my partner have been debating whether to give everything up and travel over there for a year, (inc our jobs, furniture & cats ?) but we are very stuck with money we would need, especially if we were taking internal flights the odd time to explore the whole of Aus, we would work to earn money to ensure we can still travel but we really are stuck, any rough advice would be so appreciated! Also, is it best to hire a camper van or car, or would you just take public transport and planes? I suppose we would want to start in west coast as I have family in Perth and then gradually go to Great Barrier Reef, Sydney and possibly Melbourne if possible, what would you suggest please? July 2017 for a graduation gift. My granddaughter likes nature ,but also wants to climb Sydney’s bridge and visit the zoo. We are wondering if it is possible to afford going to Sydney for 3 days, Adelaide to visit Kangaroo Island for 4 days then Alice Springs or Uluru to experience the outback for 4 days then back to Sydney . We would be coming from the East Coast in USA. We want to make this an unforgettable experience for her so any help or suggestions would be welcomed. It was a great article. Thanks for sharing. I can’t really say if you can afford it or not as I’m not sure of your financial situation. I’d research the cost of doing all of these activities, including flights to get to each one and see if you can. If you’re flying to each destination then it would fit okay into the two weeks. I absolutely loved your article and it is helping me plan my trip I hope. I am leaving the cold shores of the UK in January 2017 to spend three months in Australia and am at a loss as to where to begin, well a little at a loss. I have decided to spend the first month in Peregian Beach and then do Great Ocean Road and after that haven’t a clue!! I don’t want to spend the whole time away travelling as want to rest (I am 61) but do love trekking and hiking. Ive been told to go to Airlie and Cairns so will check out how feasilbe that is and if anyone has any tips, I would be extremely grateful! Thank you again for your article. I have a question that I hope you can help me with. A trip to Australia is on my Mom’s bucket list, unfortunately she is a senior with mobility issues. She is not confined to a wheelchair but is only able to walk and climb stairs for only short distances without the aid of a walker. She does use oxygen, but has solved that problem with small portable oxygen condenser that is permitted on planes and is very lightweight. What types of access do people with mobility issues have in Australia? Would bringing her walker be a good idea? I will accompany her on this dream vacation and would like to know what to expect. Thank you. It’s not something I’ve particularly looked out for Pam. But given Australia is first world I’m guessing it won’t be a problem. I’m sure we have many citizens who are in the same situation so the facilities are there in place for them. It would be the same for your mom. If having a walker makes travel easier for her then sure bring it along. There’ll be plenty of ramps and the pavements are even for walking. Hello there for new 2017 I will be going to Australia to visit my friend Becky for two weeks. Ill be staying with her so accommodation is sorted but what I want to know is roughly how much are return flights she lives in Port Macquarie. So I would have to get a coach / bus to the coast but I don’t mind I am really looking forward to it. I’m from San Francisco and only have 2 weeks for my 50th, this has been my bucket list to do: hold a koala and see kangaroos, the opera house and see my friends in Wollongong. I’m pretty torn where to spend my time. I was suggested to do Brisbane then Sydney. While others wanted Melbourne then Sydney and if time see other places in between. I know you said to plan before so what is your suggestion? Note I haven’t booked anything yet and my days are 11/27-12/10 so I should book soon before flights go up correct? Thanks! Hey guys thankyou for the article. Can you advise me on periods to book between over the Christmas period in a us so I don’t get caught out with massive expense and limited availability ? Is anyone travelling on a WHV as I am hoping to come on one in November ? Excellent article because it is true that many visitors don’t realise the size of the country. Giving advice on deciding what kind of Australian experience people want was great because it does then help to narrow down where they should go. Giving itineraries is really helpful. I hope you can help me a bit further. My family is visiting me from overseas in Australia for 2 weeks come this summer 2017. – We are starting off in Cairns, planning for Great Barrier Reef for 2 days. Suggestions on staying there vs. staying in Cairns. – We then fly to Sydney to spend few days. Top things/places to see & do in 2-3 days? – Finish off in Melbourne for 3 days. Im scared it would be too hectic for them, but want to make sure they experience it all since it might be the one and only time they visit. Was thinking if I should not include Tas and extend Sydney and Melbourne for a day each. Would love to hear your advise! I think that will be okay. It will be busy but if it’s once in a lifetime why not? I live in Georgia. To arrive to Australia, to me it is necessary the visa. As well as where it is possible to catch the visa to Australia? In my country there is no consulate Australian. I’m Australian, yet I never know what to tell people who want to visit. There’s just so much to see and do – where do you begin? I shared your article with an overseas acquaintance who’s trying to plan a holiday here. I found it really helpful too, as I still haven’t visited some of these places. A well thought out and written article. Thanks. Thanks Cindy. Yeah visiting Australia can be overwhelming for those first timers planning a holiday. Hopefully your friend finds it helpful too. yeah, fabulous planning for Australia trip. It’s a great idea to spend time with your family or friends on 2 weeks vacation. 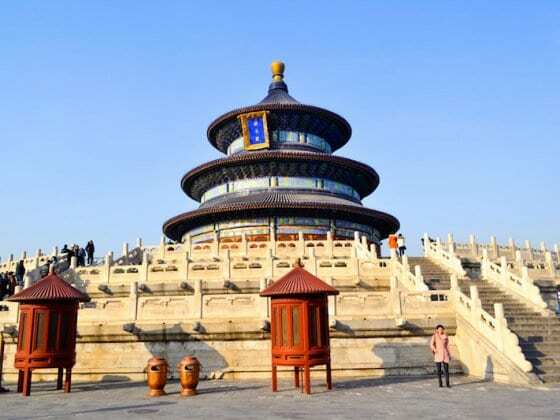 It is the one top most tourist attraction place. As per my experience recently I have visited Australia through Goflyla using travel coupon discount code. So it’s possible to make my trip so easy and safe. I enjoyed a lot there. Thanks for sharing your experience. We would like to do the three-week trip suggested on this website (Sydney, Cairns, Uluru and Melbourne) this June. To save some money, we are thinking of camping wherever we can. Question: should we bring our tent, sleeping bags, etc from the United States, or rent something there? Thanks. I’m not sure about renting, but you could to into KMart pr Big W (knda like walmart in Australia) and buy your gear. You could get it super cheap and it would last for the three weeks. IT would be cheaper than bringing it over and possibly renting. When camping as well, you’ll find a lot of free BBQ’s which will save on a lot of cooking gear. You’ll still need a small burner for boiling stuff etc. just came back from a 3-week vacation Down Under. Australia was the place I wanted to see most and it absolutely met and exceeded my expectations! Visited Sydney, The Great Barrier Reef, Daintree Rainforest, The Red Centre, and Melbourne. Would love to go back for Western Australia, South Australia, Tasmania, and Kakadu National Park. Australia is among the most amazing places I have visited in the past year and really these places mentioned in the post are very good for sightseeing and sightseeing. I like the region because of the variety of options for having fun with friends. We are driving from Sidney to Brisbane in 2 weeks. What are your suggestions?